The river Lidder that flows through majestic mountains and meadows near Pahalgam in Kashmir had earlier this year taken on a ferocious form, threatening all life that breeds alongside its banks. But before nature played truant, perhaps in just retaliation against man, a community of nomadic tribesmen began to migrate southwards from their camps at high altitudes near the Kolahoi glacier. Customarily making this journey in October every year with the first fall of snow, they were moving southwards in August, when the temperatures in Pahalgam were a temperate 30 degrees. After the last of these herdsmen had made their way down from the higher mountains, the valley witnessed incessant rains that culminated in the worst floods Kashmir has witnessed in living history. The meadows along river Lidder are camping grounds for the Gujjar and Bakarwal communities. Had the lives of this nomadic tribe, so immersed in nature, provided them with clairvoyant gifts that modern technology lacked? These and many more unique insights lie hidden to the world and are increasingly threatened and marginalised amidst vigorous developments in their home state, as in other parts of India. 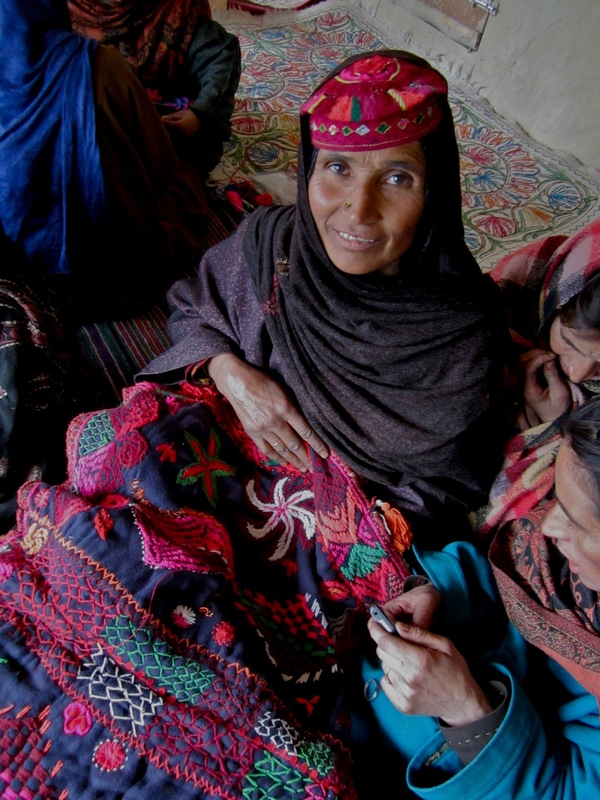 Aiming to revive and sustain the inherent hand skills of the Gujjar and Bakarwal community, the Shepherd Crafts project located at Langanbal village near Pahalgam in Kashmir is dedicated to documentation, design and retail of their handmade products. The project provides an alternate source of income and access to health care to the women beneficiaries. Since the community is migratory, the project, led by Ramneek Kaur and Devika Krishnan, is engaged in plotting their routes, base camps and schedules to stream line their process of giving out materials and instructions and receiving finished pieces regardless of where the women are based. In addition to providing a platform for craft preservation, The Shepherd Crafts project has also researched the possible route this clan has travelled since 5th Century AD. The motifs and stitches of the free-form embroidery of this tribe are an amalgamation of the various cultures the community has been exposed to during their centuries old migration from Greece, through Persia, Turkmenistan, Swat valley, Gujarat and then upwards to Kashmir right up to Uzbekistan and back now. This brightly colored embroidery is peculiar to the clan and can be found in the caps worn by the women and the saddle cloths and braided straps with which they deck their ponies. Often, the colors used by the Bakarwal women reflect their moods or what they wear on that day. 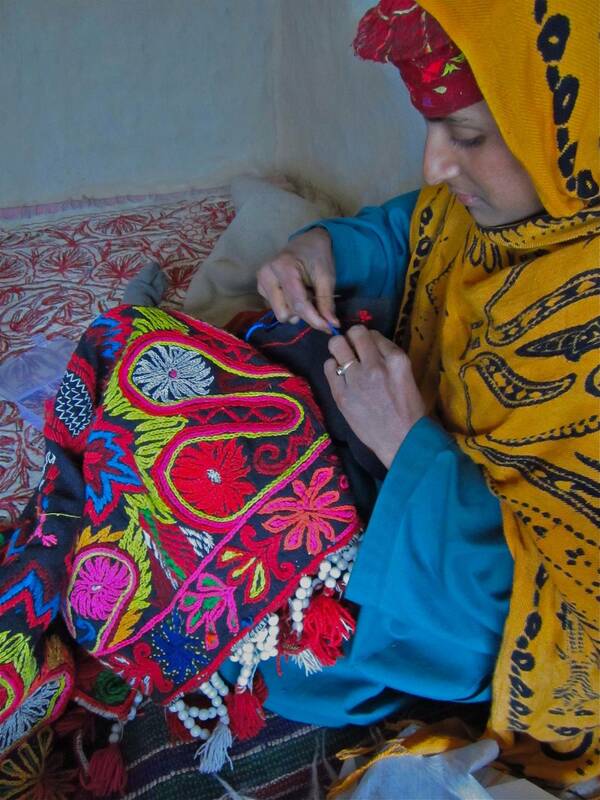 On the left is an example of this extension of one’s self; tribeswoman Mumtaz is busy embroidering a bag with colors that match her kameez! Begun Bano (seen on the right) is the matriarch of her Gujjar clan from Awra village, near Pahalgam. She and her brood migrate 40kms annually to the sub-alpine pastures near Kolahoi glacier at an altitude of 5400 mts. above sea level. The vistas along the river Lidder are spectacular all year round with each season distinctly different from the next. The shepherds migrate annually along the Pir Panjal Mountains in search of green pastures. The intervention and support of the Shepherd Craft project has provided a window into the simple world of these migrant shepherd communities and for them to the busy world outside. Posted in Crafts, Decor, Embroidery, History, Homes, inspiration, Jammu & Kashmir, People of India, Profiles, Textiles, Travel, Tribes, Women, Wondrous India and tagged Colors, Embroidery, kashmir, lidder river, pahalgam, shepherds, tribe, Women. Bookmark the permalink. How can I contact Shepherds crafts project.